DWR plans to build an emergency access road to Pyramid Dam in northwestern Los Angeles County, California, in the Angeles National Forest. Old Highway 99, which runs parallel to Piru Creek, is the current access road for Pyramid Dam. During past storm events, a 300-foot section of Old Highway 99 was eroded into Piru Creek, resulting in unreliable access to Pyramid Dam. In addition, Old Highway 99 has two major bridge-crossing, which could potentially fail during a maximum flood event or substantial seismic event, impeding full access to Pyramid Dam. The purpose of the emergency access road is to provide full and adequate access to Pyramid Dam in the event of an emergency and for necessary periodic inspections and maintenance. Aspen prepared an Initial Study and Mitigated Negative Declaration (IS/MND) and a USDA Forest Service Biological Evaluation/Biological Assessment (BE/BA) for the project. 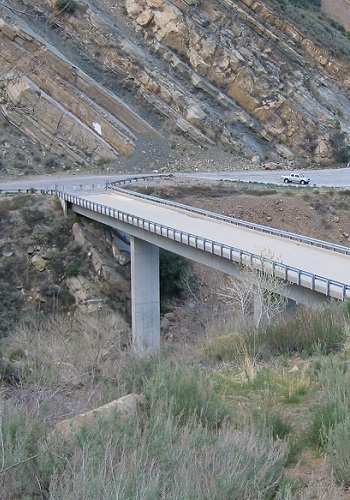 Construction of the emergency access road also required the acquisition of permits from the U.S. Army Corps of Engineers, the Regional Water Quality Control Board, and the California Department of Fish and Wildlife (CDFW). Construction of the also required a pre-construction survey for nesting birds and rare plants to comply with the mitigation requirements identified in the IS/MND and BE/BA. To support these efforts, Aspen completed a jurisdictional wetland delineation report, consulted with CDFW, prepared applications for CDFW Section 1602 permit and Clean Water Act Section 401, 402, and 404 permits.